It’s a bullet kind of blog entry! The initial plan was to hold an afternoon sort of tea party with the Un-birthday Party theme (nod to Mad Hatter). But I realized I really do not have what you can call a ‘barkada”. My friends are in clusters, so putting them in one room to dine (particularly in Banapple) would be awkward, I thought. Plus, I don’t know how to accommodate them all. Not that there are too many. I planned to invite 30, actually. Oh well, I had fun doing the preparation in my mind, nevertheless. I spent the first Feb weekend with Venn during our Venn Vacation 2 in Baguio. We weren’t in the mood, I guess, to take dozens of pictures (even if we have awesome cameras compare to the ones we had in Bora) so no photobook this time. Plus, we really didn’t have too many photographable happenings during the 3 days/2 nights trip, because we basically just dined in Baguio and enjoyed the cold weather (although not as cold as we expected it to be). Bonus in Marvin’s Baguio Redemption: I got a signed copy of Kikomachine Komix Blg. 8! Manix Abrera was in the Komikon. It was my first Komikon, and would probably be my last din yata. hehehe Kidding. It was fun but couldn’t help but feel out of place a bit. Back story of The Redemption: Tinulugan kasi ako nang minsang umakyat ako sa Baguio for a quick day trip noong Hulyo. So, there. Redemption, a success naman. I also got to visit my folks in La Union. The 10-hour sleep there was refreshing, as always. A kilig-filled kwento over lunch was spent with my sisterette, Benj, one fine weekday. I love it that we can just hang out whenever both of us are available. Valentine Lunch was with Atenie, na medyo may tampo dahil hindi s’ya ang kasama ko sa Baguio. Hehe Looking forward to going there with you again, Atenie! We had a sumptuous lunch at Stacy’s. Spent time with Dearie on the following Saturday. And we’re going to watch Wicked next week! After pending it for a year, we finally knocked at the door of Pinto Art Museum. That museum up in the Antipolo mountain was the bomb! Ang daming artworks! I had a blast photo shooting with Jel, Anna and our little barkada, Angel. Naubos ang battery ko in just three hours. I shall be back to appreciate the artworks more. Promise. Jel and Anna gifted me with beading magazines, too! Such thoughtful friends, I have! For my birthday, I reserved a table for my family at Vikings for lunch. I ended up canceling the reservation. Ayaw nila. Sa kung saan may spaghetti, rice, chicken at ice cream na lang daw sabi ni Aaron. Jollibee, it was. I love my low-maintenance fam bam! And since I won’t be experiencing hanami (yet) this year as part of celebrating my 30th year on earth, I had to have a cherry blossoms cake! Fortunately, I have a talented cake artist friend in Micah, she willingly obliged to take on my challenging order. Ang saya! Three cherry blossoms cake for me! Yay! With Nanay, I always had to have a cake for my birthday. 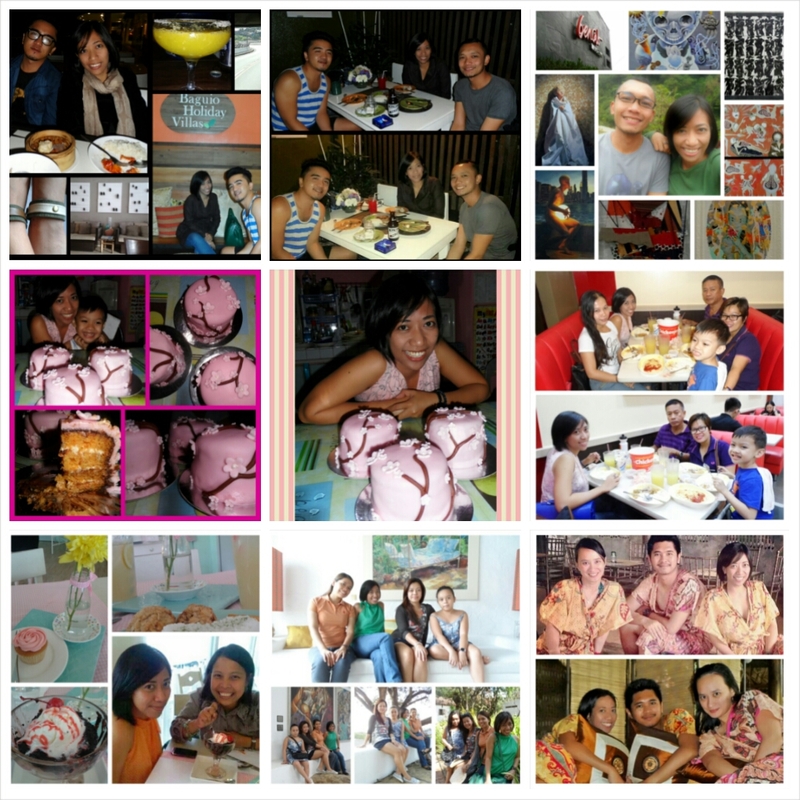 Kaya siguro every birthday ko (or ng iba), I’ve always made sure may cake. Kahit pa ako ang magpagawa ng sarili kong cake. I’ve surprised friends with cakes on their birthdays (and will continue whenever I have the chance) and it’s fun to see their delight every time. A pending visit to try the Kabigting halo-halo with Em was finally fulfilled during my birthday week. Masarap nga naman ang halo-halo na ‘yun. It was fun seeing preggy Sis. Hanggang ngayon, I couldn’t get over the kilig and the excitement that there’s an actual living thing growing in her tummy. Kaka-excite! And then, may postcard akech from Marrakech! It was from Rhea, my globe-trotter friend. I look forward to travel with her someday. Short but sweet food trip with my fellow Feb girl, Mitch, was fun, too. Ang dami lang kwento. We often chat online, but still nothing beats a good ol’ catching-up over tacos and donuts. I also got to spend a fabulous time with the fabulous quasi-lovers, Arri and Marge, last Saturday in a spa. We had a blast enjoying all the amenities offered by Luljetta’s Hanging Gardens and spa. The massage was superb. We splurged a little, but it was so worth it. February is about to end, but it has been so much fun. I am so grateful for my loving family and great friends. Thankful to Thee for the chance to experience being loved by these amazing creatures. Grateful to Universe for throwing them into my life. I look forward to spending another 30 years (or more) with them.